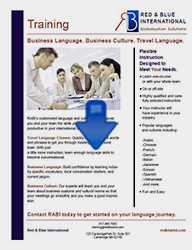 We provide customized training that builds on employees' existing language capabilities. Although employees may have a conversational level of language fluency, they may not have a full understanding of industry specific terms and general business terms in the foreign language, or they may want help with conversation starters and ways to make connections with colleagues in the country. We tailor our instruction to meet the needs of our clients. Clients may wish to opt for a group staff class, one-on-one executive instruction, and/or on-site training. To speak with a RABI representative about your training needs, please call or email us today.